BOSTON, MA–More than 200 people turned out on Friday as the nationwide Rock Against the TPP tour protesting the unpopular Trans-Pacific Partnership (TPP) trade deal came to the Boston area. 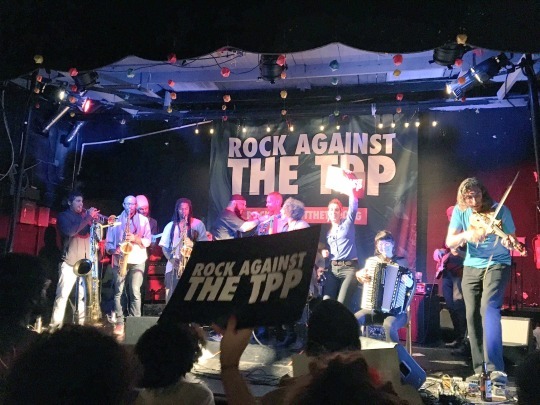 The concert, which featured well known acts including Mirah and Debo Band, was followed by a training session where participants planned future actions to pressure undecided local lawmakers Rep Seth Moulton and Joe Kennedy, to vocally oppose the TPP. Scroll down to see some short video clips from the concert. Organized by digital rights group Fight for the Future in partnership with legendary guitarist Tom Morello (Prophets of Rage, Rage Against the Machine, Audioslave) and riot-folk singer Ryan Harvey’s record label Firebrand Records, previous stops on the tour have featured high-profile participants including actress Evangeline Lilly, hip hop icon Talib Kweli, comedian Hari Kondabolu, Dead Kennedys singer Jello Biafra, legendary punk band Anti-Flag, Danbert Nobacon of the UK sensation Chumbawamba, Adult Swim comedian Eric Andre, and ANTI records songwriter Jolie Holland. The roadshow has already drawn large crowds in Denver, San Diego, Seattle, Portland, and San Francisco. The TPP has little to do with trade, but instead grants multinational corporations extraordinary new powers to threaten jobs, the environment, affordable medicine, free speech, and food safety. The Rock Against the TPP tour brings together a broad coalition of supporters including digital rights groups, labor unions, environmental groups, and small businesses, and is sponsored by Backbone Campaign, Citizens Trade Campaign, Communications Workers of America (CWA), CREDO, Demand Progress, Friends of the Earth, the International Labor Rights Forum, Public Citizen, Sierra Club, SumOfUs, the Teamsters, and United Steelworkers. Organizers plan to announce additional dates to the tour soon. Additional performers at the October 7th event include afro-latin rock group Taina Asili y La Banda Rebelde and Firebrand Records artist Bell’s Roar. SEE PHOTOS AND VIDEO OF PREVIOUS SHOWS AVAILABLE FOR USE BY PRESS HERE. For Interviews with artists or organizers, please contact Evan Greer at press@fightforthefuture.org or (978) 852-6457.